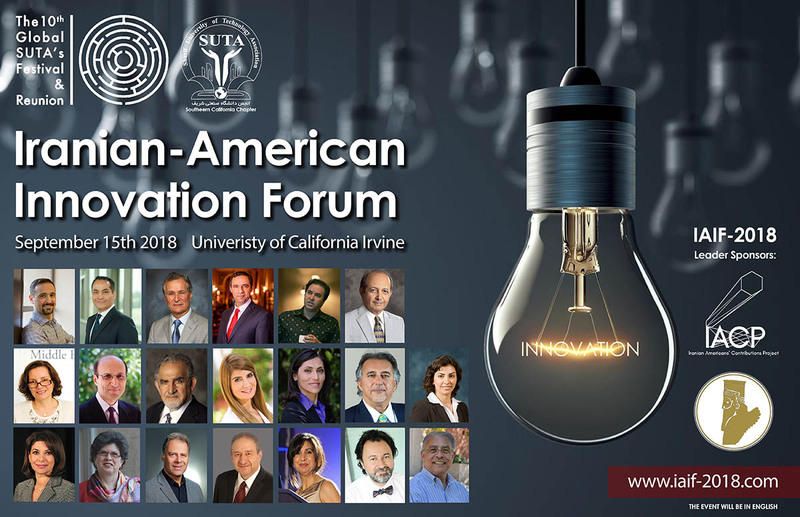 Sharif University of Technology Association (SUTA), together with the Samuel Jordan Center for Persian Studies and Culture at the University of California Irvine, and the Iranian-Americans' Contributions Project (IACP), are proud to present the day-long Iranian-American Innovation Forum, in the Pacific Ballroom of UC-Irvine, on Saturday September 15th, 2018. At the Forum, leading Iranian-American innovators, technologists, entrepreneurs, and professors will address what technological, business and social innovation mean to them and how, in their opinion, we can use innovation (in the broad sense of "doing things better") to tackle some of the most significant challenges confronting America and the world: job creation and the AI revolution, affordable housing, environmental challenges and response, smart growth and development, immigrant integration, and promoting a culture of opportunity, teamwork, inclusion, stewardship and cooperation to empower individuals and communities. IAIF IS A NON-POLITICAL AND NON-RELIGIOUS EVENT.